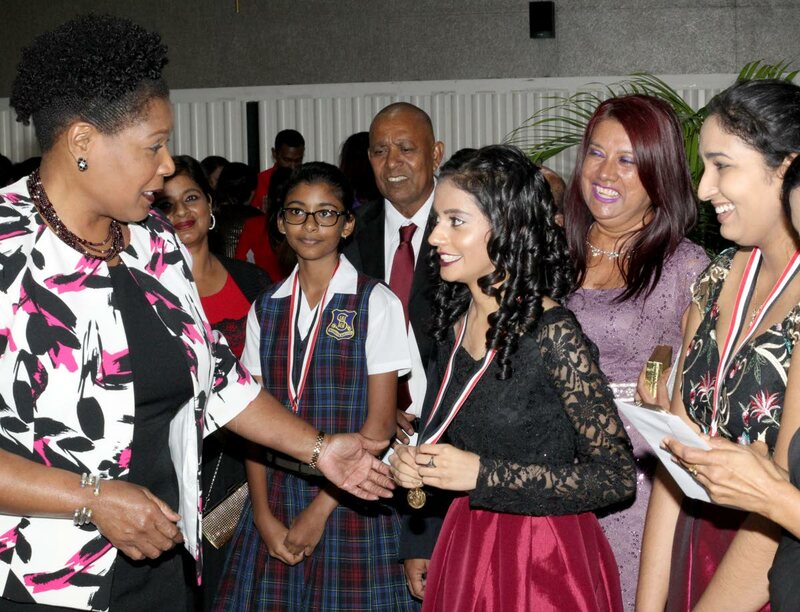 President Paula-Mae Weekes, left, speaks to Sadhana Balladin, recipient of the President's Gold Medal for High Learning, third from right, alongside other recipients; Jada Ramnath and Amrita Singh, at the President's Award ceremony honoring students' outstanding achievements in CAPE, CSEC and SEA in 2018 at the Northern Academy for the Performing Arts yesterday. PHOTO BY ROGER JACOB. PRESIDENT Paula-Mae Weekes is concerned there are too many multi-degreed people in TT who are "selfish, inconsiderate, greedy, uncaring and amoral." The President also said the education system must be re-thought "to have any chance of producing the individuals that we want and need to lead this country into the future. She made these statements at the President's Medal Awards ceremony at the National Academy for the Performing Arts in Port of Spain. In making these statements, Weekes reminded her audience of the saying, "Don't shoot the messenger." But the President added, "Today, I say if shooting the messenger will bring about the desired result, I'll take the bullet." After observing that there were multi-degreed people who lack the "empathetic bonds necessary to make them valuable people," Weekes urged the six award recipients to be vigilant that "this does not happen to you." She advised them to develop their generosity, compassion, moral compass and their patriotism, while keeping up with their studies. Weekes advised the parents in the audience "to be as concerned and consumed about your children's character and public spirit as you are about their academics." The President said if people were being honest, the school curricula was not "delivering the quality individual we need to build this nation." While a small percentage of students will be absorbed into traditional professions, Weekes said 100 per cent of them were going to be citizens. She said their conduct, value systems and patriotism would "determine our viability as a prosperous nation, in every sense of the term." As a former law school lecturer, Weekes said she was disappointed to learn that a significant percentage of the students were lazy and dishonest. The President said many of these students had a sense of entitlement and wanted maximum return for minimum effort. Saying some of those students were scholarship winners, Weekes said it was clear these failings "had been carried over from their earlier interaction with the education system." The President recalled that dinosaurs like herself remembered a primary school diet of patriotic national songs and pledges. Weekes reminded her audience that the old-school methodology helped people to understand where we came from, where we are and where we wanted to go as a nation. She said people who lamented the "state" of society must remember society was a mirror reflecting the people's collective attitudes, practices and principles. Education Minister Anthony Garcia said, "We here in TT have been brow-beaten into the belief that we cannot celebrate excellence." As a former school principal, Garcia said he had first-hand experience of seeing people have a tendency to "overlook positives and focus and harbour on the negatives." He said the ministry acknowledged the students who were performing well and would find ways to "enhance the performance of those who are not performing optimally." Garcia listed the Form One Initiative. School Based Management System and the Student Support Services Division as some of the avenues being used to achieve those objectives.